White Rabbit’s propulsion system comprises two Caterpillar 3512BTA diesel engines with ZF 4066 gearboxes, fitted with ZF autotroll system and Mathers “clear command” controls. These engines drive twin outboard turning shafts with fixed pitch propellers. The shaft angle was kept as low as possible to maximize acoustic, vibration and propulsive performance. This necessitated a shaft line over 11m long. The duplex stainless steel material used for the tail shaft is not available at this length, hence a short intermediate shaft was introduced between the end of the tail shaft and the gearbox. The new concept of a trimaran motor yacht, presented some interesting challenges with regard to the propulsion system design. The choice of the trimaran configuration gives a large accommodation platform and low resistance hull form, however it does limit the size of the machinery space. Several options were looked at in conjunction with the shipyard and the owner’s requirements, including a large single screw propeller in the centre hull with smaller propulsors in the side hulls for maneuvering and loitering. 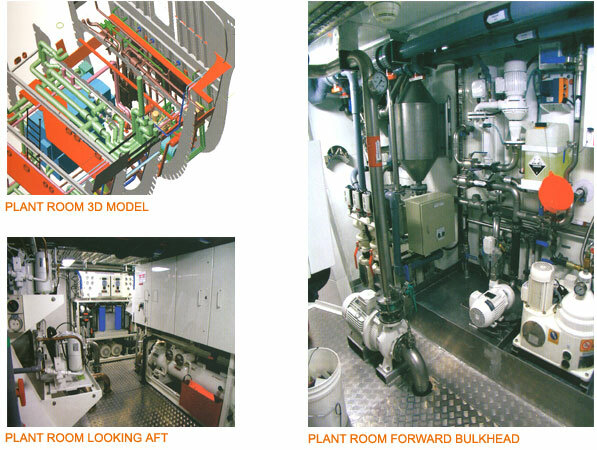 A twin screw arrangement was finally settled on as it gave greater flexibility in engine room layout, and higher propulsion efficiency with the speed and power requirements specified. In addition there is the obvious advantage of increased redundancy in operation. It was also determined that with correct shaft line positions the side hull thrusters would not be required for maneuverability. With the narrow centre hull, checks had to be made on the position and size of the propellers. Choice of gearbox ration for maximum efficiency was not just dependent on hull clearances, but also on the distance between the propeller tips. 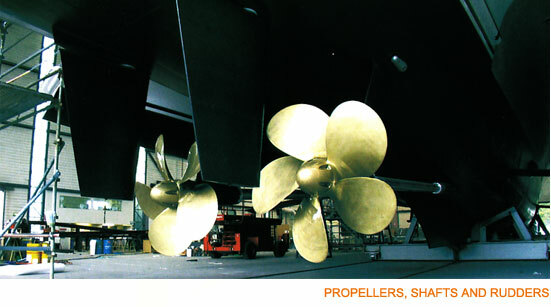 Speed requirements were quite tight, therefore large diameter high efficiency propellers were required. But this had to counter by low noise and vibration requirements. Shaft lines were angled outward slightly to enable larger more efficient propellers to be fitted, and to keep the engines within the confines of the engines room. With accurate resistance data from model tests and good weight control by the builders, all performance objective were met on first trials, the results also proved that the trimaran hull form can achieve higher speeds with lower power than the equivalent mono-hull. As a result propellers are more lightly loaded and therefore less prone to cavitations, this combined with the latest CNS machined propeller design resulted in very low on board noise and vibration levels. A schottel hydraulic bow thruster was fitted in the bow area on frame 38 and a Max power retractable stern thruster was fitted in the steering flat aft of the rudders. Each thruster is capable of delivering approximately 1 tonne of thrust. 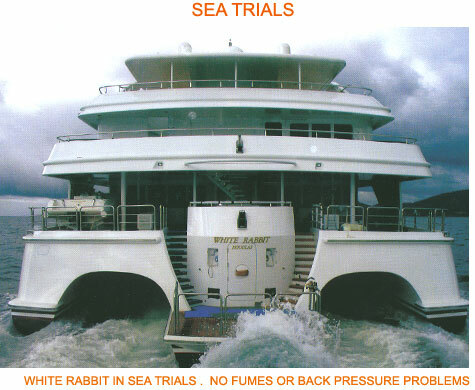 White Rabbit has however proved in trials to be very maneuverable using main engines and bow thruster alone. The design of the outlet was created using computational fluid dynamics, while the optimum locations were determined using the dynamic wave profile through model testing. Note: the change wave profile in the photographs below. Determining the optimum locations for the exhaust outlets on White Rabbit was made more challenging due to the asymmetry of the engine room. The engines are staggered longitudinally, due to the narrowness of the centre hull so the exhaust outlets are similarly staggered along the length of the hull. The initial locations of the port and starboard outlets are indicated in the model photographs by the round quadrant symbols. These locations were later moved together over adjacent frame spaces to reduce the effect on immersion of the longitudinally varying wave profile. The outlet design and location for both main engine exhaust systems were proven during sea trials-with exhaust back pressures falling within specifications. Extensive use of computer modeling was made to build 3D services models and ensure that the equipment was laid out in the most advantageous fashion. Essential services were routed with minimum impact on the accommodation layout. 3D modeling of these service routes ensured that production issues were minimized. On the upper deck, the linings around guest cabin 1 were particularly congested with exhaust air ducting, as the upper deck AC exhaust air station is located on the sun deck directly above this cabin. To maximize living spaces, services are run in close proximity to each other and as close to the structure as feasible. 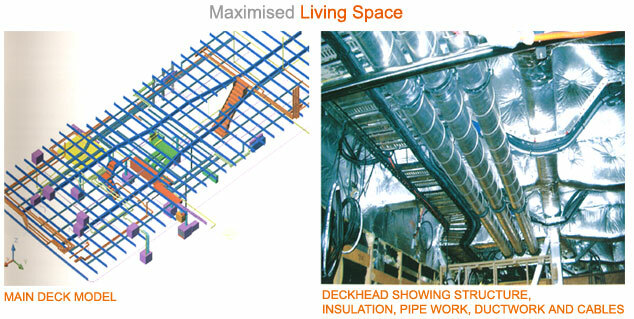 The electrical cable trays are stepped over the ductwork and under the deck head beams to fully utilize the space between main structural members. All services are designed for maximum efficiency and unobtrusive operation. All air outlets and ductwork were especially designed to eliminate noise. The main deck constitutes the ‘freeboard deck’ and penetrations through this deck have been minimized. The crew stairwell forms the main service trunk between the main and lower decks, has services between adjacent watertight compartments that preserve the watertight integrity of each compartment.